My Fall 2010 online course kicked off this past weekend, and unlike face-to-face classes, the process of getting to know my students is slow but interesting. Three-quarters have now logged in, but by the nature of the design, it will be a week before many of them begin interacting with each other. My students are all Visiting International Faculty from a variety of countries, working on their Masters in Education from VCU while they teach in K-12 schools across three states. I am using the Wimba Voice Board as a way to hear their voices and begin connecting with them. They were here this summer as a cohort, so I would suspect that they have already formed pretty tight bonds. As the outsider, I wanted to do something a little different with their introductions. I originally planned to have them use the game at http://www.gone2thedogs.com that computes their breed as a dog, but as luck would have it, the site went down the day the course started and still has not come back up. So as a back-up, I redirected students to the dog breed calculator at Dogster.Com. But that is only the icebreaker. After teaching online for 15 years and blogging for nearly 3 years, I felt that it was time to practice what I preach and move my students from commenting in Blackboard discussion boards to more open reflecting on the web. After all, this course is entitled Educational Technology for School Leaders. In this digital age, “educational technology” increasingly means web-based technology. Over the last three years, I have found that the K-12 teachers I teach start this course with a real fear of the web. Part of that is the fear of the unknown…the fear that they will appear less knowledgeable than the children in their room. But the other fear is based on genuine issues of safety, inappropriate behavior, and lawsuits. As Scott McLeod noted last year, if we are not working on the web and teaching appropriate use of the web to our children, who will? So it is time for my course to stop exploring the web and start using it. With only 13 students this fall, this feels like a good class in which to try this. Neither I nor they should be overwhelmed. Following the good example set by Jon Becker in his Education Politics class, I have created a Google Sites class space to aggregate the RSS feeds from my students. As they are checking in to the Blackboard space, they are finding links to four potential blog sources that they can use to create their blogs. The first few to do so are following advice that I got from Jeff Nugent and have passed on to them, which was to suggest that they could blog anonymously. 1. 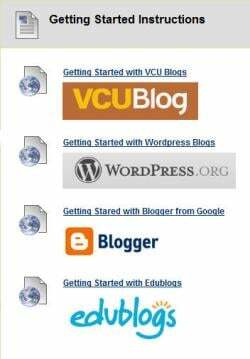 While your blog is your space, treat the one your are using in this class as your academic publishing platform. Speech that is inappropriate for your classroom is probably inappropriate in your blog. While critical reflection and healthy skepticism are part of blogging, your comments should always be presented in a way that reflects how you present yourself in your classroom – as a professional. 2. You are not required to divulge your identity in your blog nor identify your school. Your blog is a public space on the Internet. Do not share anything you do not want the world to know. As a recent video noted, what happens in Vegas stays on Facebook, Twitter, YouTube, and a host of blogs. Assume that a future employer will review your blog and write accordingly. 3. Finally, practice good scholarship on the web. Link to your sources. Give credit to others if you use their thoughts. If you do link to a website, make sure that you have reviewed that link. If it contains material that might make others uncomfortable, think before you use it. We will be exploring the darker side of the internet in Module 3, but that does not give you license to pull it into our class. With the links above, I am obviously focusing on the technology as I help them start, but I also think that it is important that they see this blog as a real departure from education as usual. They are used to college courses requiring them to work and submit original thoughts (through papers and online discussions), and they are also used to that original material being shut off from them at the end of the semester. That is the way universities have taught for hundreds of years…and the original learning management systems simply replicated that model. But as others have been doing (and I have enjoyed watching Jeff Nugent do this with his classes, as well as the neat work up at University of Mary Washington), some students have been given ownership of their own intellectual property. 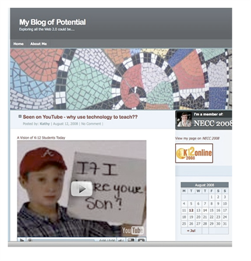 The blogs that my students create will belong to them…to do with as they will. I will be grading their use during my course because that is what professors do. But the thoughts they raise and the reflections they post will be theirs. They may or may not continue blogging after this semester, but my hope is that they will connect to the larger network of fellow learners…and in the process, become better able to advise the not-so-savvy digital students inhabiting their classrooms. By next week, they should have created their own blog. I am going to have “topics” for reflection on a weekly basis, and part of the rubric for grading includes commenting to fellow students. Their first reflection will be on the “Welcome to My PLE” video I discussed in my July 14th post on the Socially Networked Student. I am interested in their take on this 7th grader and her use of the web for learning. Bud Deihl and I used this video in our talk at Elon University and got some interesting push-back from some faculty who only saw an ability to cut and paste. I am wondering what my students see? Is she typical? Would she be welcome in their classrooms? The students will post by September 10th and comment through September 12th. I am excited and looking forward to seeing where this use of social media will take my learning and their learning as the semester unfolds. For those of you who have taken this approach already, any advice will be welcomed! 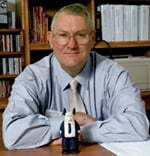 Dr Watwood many of us realized very early that there was much censorship and political correctedness of using the web. By the time you are finished with us we should be ready for the Web 2.0 world. I know that many of us will continue to blog as we take our students to higher heights and greater depths. Our appetites have been whetted and the only way to appease the technological hunger is to continue blogging until we are true technocrats instead of technophobes. Pingback: Is Networked Learning Doomed in Virginia K-12? « Pedagogy First!